Now you may be an outstanding guitar player but are useless as a percussionist. Your Mac can help. Perhaps you’re in a talented band that happens to lack a Ringo. The drummer feature added with GarageBand 10 can supply just the percussionist beat you and/or your band mates need. For a general overview on how to audition this drummer, go back to starting an Empty Project in GarageBand. As you may recall, a window slides into view, letting you select Software Instrument, Audio, or Drummer, the choice you make here. You get to select a genre for your drum set, get to choose a session drummer from within that genre, and then get to decide which of the signature style presets available for that drummer you want to choose. Rock is the genre by default, but you can opt for Alternative, Songwriter, and R&B instead. Each of the drummer choices within those genres has a character card and description of the playing style, so you can get a feel for whether this virtual drummer fits your requirements. To take one example, an Alternative drummer named Aidan is described as “restrained, simple, indie rock beats on a natural kit.” The presets that go with his style include Burnside, La Luna, and Rip City, among others, and while you’re unlikely to know what any of that means, you can hear samples before choosing what is likely to go best with your compositions. 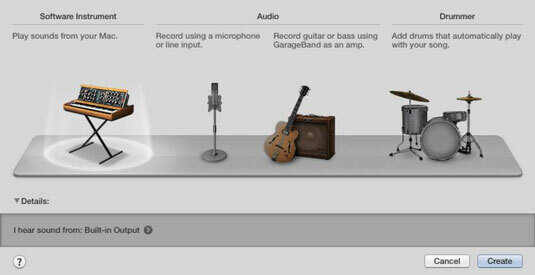 Garage Band actually only comes with a single drummer. To get the complete set of 15 drummers, you must fetch the additional sounds and instruments package, part of that one-time $4.99 purchase.